Max Christie has resigned from his post as Tranent boss and looks set to be unveiled as Bo’ness United’s new manager – just days after his side thumped the BUs 5-0. Former Bonnyrigg Rose boss Christie led Tranent to an emphatic victory over their East of Scotland B rivals last Saturday which led to Bo’ness manager Steve Kerrigan heading out of the Newtown Park exit door over the weekend. 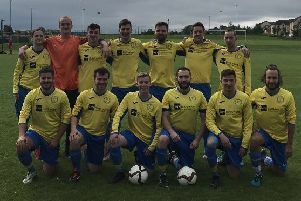 Christie, who joined the club in December 2017, spoke in the aftermath of Saturday’s victory that he was targeting a second-place finish with the East Lothian club. However, he has quit Foresters Park along with his backroom staff of Ian Black and Kevin Haynes – and all three could be in the dugout on Saturday as Bo’ness visit league leaders Bonnyrigg Rose. Player-assistant manager Andy Shirra is currently in temporary charge of Bo’ness and will remain in the dugout for Saturday with Christie set to take the reins next week.